Taphouse Brewpub owners Guy Falkingham and Lee Kirman have invested more than £150,000 to transform a former fruit and vegetable warehouse into a destination venue. Photo: Jack Gray. A bar and brewery offering craft beers brewed on site and from around the world has opened in Hull’s resurgent Fruit Market quarter. Taphouse Brewpub combines a working brewery with a high-quality bar offering almost 40 draught craft beers, lagers and ciders, as well as an extensive range of bottled and canned beers, quality wines and artisan spirits. Discerning drinkers will be able to enjoy craft brews in a stylish space which will also host regular entertainment including live music, comedy nights and regular tasting sessions. The venue is East Yorkshire’s largest brewpub and brings a new dimension to the ever-evolving Fruit Market waterside community. The in-house brewery is shared by Yorkshire Brewing Company, which has been hand-crafting quality beers in the Fruit Market for more than six years, and Bone Machine Brew Co, which sends its brews out across the UK and into Europe. The brewers will produce traditional and contemporary beers including pale ales, bitters, lagers, IPAs (Indian pale ales), brown ales, mild ales, porters, stouts and other specialities. To complement the craft brews, Taphouse Brewpub offers hearty platters and homemade bar snacks during the week while, at the weekend, street food operators will bring their own unique tastes to the venue’s kitchens. 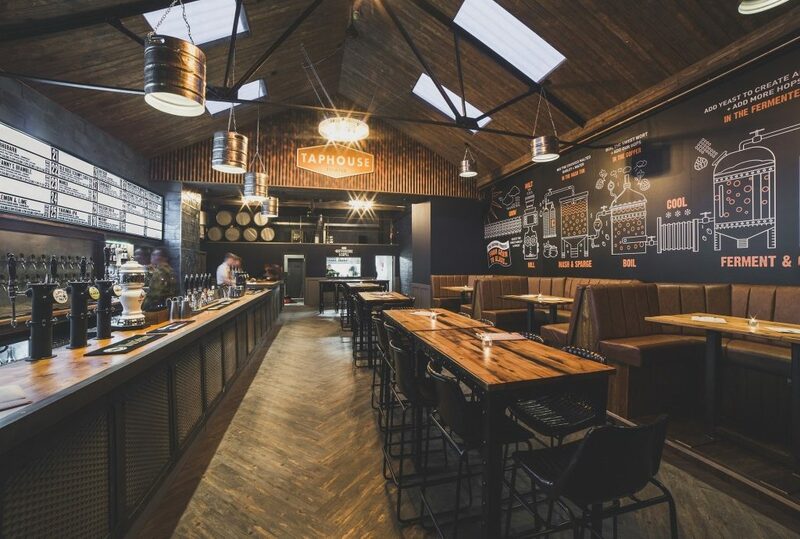 Taphouse Brewpub is owned by Yorkshire Brewing Company’s Guy Falkingham and local licensee Lee Kirman, who have invested more than £150,000 in a redevelopment and fit-out which has transformed another of the Fruit Market’s former fruit and veg warehouses. The opening has created 12 full and part-time jobs. Mr Falkingham, said: “We’re so excited to bring our brewpub concept to the Fruit Market. “We believe our customers will love the look, feel and atmosphere and really enjoy having a sociable drink or two in the bar while our brewers work in the same building. 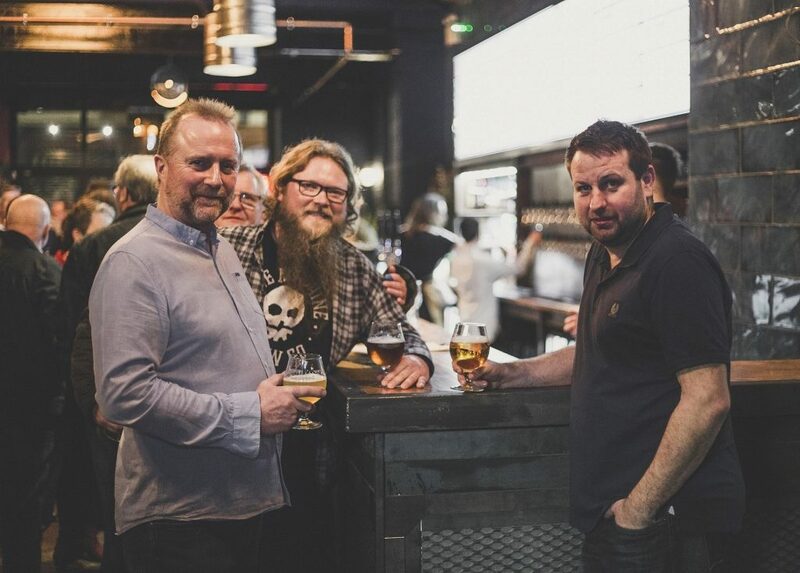 “A selection of the beers and lagers we will have on the bar will be brewed on the premises, while others will be sourced from across the UK and all around the world – so it couldn’t be a more authentic experience for fans of real ale and craft beer. Mr Kirman co-owns the successful Minerva pub and Humber Street Distillery Co. gin bar in the Fruit Market with his partner Charlotte Bailey. He said: “We love the Fruit Market and we believe our other businesses have played a big part in its revival. “This new venue will give the area another big boost. It will support the restaurants and cafés around us and generate increased footfall for all the other independent, creative businesses that make this such a fantastic place. The bar and brewery has a stripped-back look with original features on display. Comfy leather-backed booths and high tables occupy the front of the 4,000 sq ft space with the brewing tanks on display at the rear of the building. The venue has a welcoming, glazed bi-fold entrance on Humber Street, with the brewery illuminated and on view from Pier Street, making it a feature of the Fruit Market. It has become the new home for Finnish brothers Marko and Kimi Karjalainen who launched Bone Machine Brew Co in Pocklington, East Yorkshire, two years ago and now distribute their distinctive brews across the UK and to outlets in Finland, Sweden and the Netherlands. Mr Falkingham added: “We’ve teamed up with Bone Machine because we have a shared passion for artisan brewing. Together we can offer a great range of brews for our in-house customers and growing number of wholesale and retail outlets, as well as creating a fantastic brewery. “We want to maximise the appeal of having a working brewery and bar under the same roof. We’ll be offering brewery tours on a regular basis so people can learn about the brewing process and taste a few samples and there’ll be the opportunity for people to brew their own beer. The new Taphouse Brewpub in Hull’s Fruit Market combines a contemporary bar with a working brewery. Photo: Jack Gray. 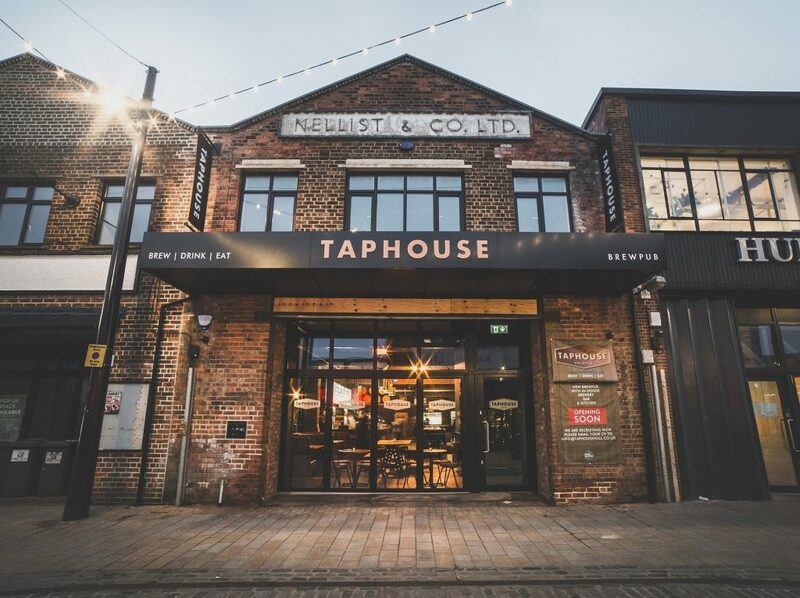 The Taphouse Brewpub is the latest new business to join the thriving Fruit Market community, with three more openings due within the next few weeks – fashion store Tessies; bohemian bridal boutique Ghost Orchid Bride; and urban lifestyle gym The Temple on Humber Street. Tom Watson, Development Surveyor for Wykeland, speaking on behalf of Wykeland Beal, said: “It’s great that Taphouse Brewpub has opened in a building that has been completely renovated and brought back to life, through our extensive conservation works and Guy and Lee’s impressive refurbishment and fit-out. “We’re also really pleased that this exciting, creative venture has grown out of one of the first businesses to establish itself in the Fruit Market following the relocation of the city’s wholesale fruit and veg trade. The Taphouse Brewpub is open seven days a week, 11am-11pm. For more information go to www.taphousehull.co.uk or follow the venue on Twitter, Facebook and Instagram at @TaphouseHull. Be the first to comment on "Taphouse Brewpub brings beer lovers’ paradise to the Fruit Market"